Let's be real for a second: The PlayStation 4 and Xbox One designs are hideous. Sure, both are great gaming consoles, but their cases employ the same look of every generic VCR from the 1980s. Thankfully, Etsy store-owner Decalgirl has a fix for that problem. Decalgirl had been making high-quality vinyl stickers for more than a decade, and her Etsy store offers dozens of cool ones that add personality to boring monochromatic machines like the iPad and MacBook. The real appeal of her sticker store, however, is the retro NES series she made for all the new consoles including the Wii U, Xbox One and PlayStation 4. The stickers are pretty damn easy to fix to your console. The store also promises there will be no air bubbles thanks to the type of vinyl the stickers are printed on. The best part about it is the price. For $US27 plus shipping, you get large vinyl stickers that cover the front, top and sides of your gaming console. Now you won't feel so bad looking at that ugly black box at the centre of your living room. The worst part about it is that it only ships within the US. So either you're going to have to hit up that American cousin again, or simply learn to live with your eyesore. The PS4 design is great, what are you talking about? Author must've had a really amazing VCR in the 80s if it looked like a PS4. Man. VCRs in the 80s were awful. You know what we need to do? 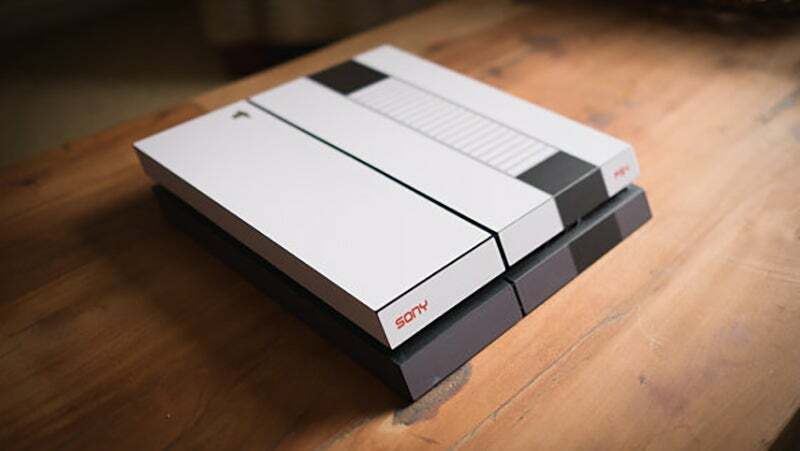 Make our consoles in 2016 look like a console from the 80s! WINNING! I personally like the Xbox One too other than the size of it, something addressed with the S model.